Are you looking for the best travel pram? As the holiday season approaches people start to ask me to recommend them the best travel pram. While there is no absolute best travel pram, it’s simply a matter of working out what is the best travel pram for YOUR family. I’m going to say also that these clever little pocket rockets aren’t just travel prams. I’ve chosen them because they can be used as your every day pram as well – they’re perfect for small cars, zipping around the supermarket, squeezing onto public transport, if you have limited space for storing a pram, or need a super light pram for lifting in and out of the car. If you just want a one-trip-wonder that doesn’t need to be suitable as an everyday pram, consider one of the umbrella strollers from our best cheap prams. First of all the GB Pockit pram BLOWS MY MIND. It’s the most compact pram in the world! When folded it fits inside a shopping bag (or a backpack, heck you could probably even a large nappy bag). It weighs a teeny tiny 4.3kgs! The fold on it is just the coolest I’ve ever seen – though admittedly it took a little practice to get it to go down in one smooth movement. Unfortunately the seat doesn’t recline at all and doesn’t take a travel system, so it’s not suitable for newborns at all and the weight limit is a little low – only 17kgs. Also the hood is practically only for decoration. Mountain Buggy is not a brand I’d usually associate with light and compact – they’re better known for their all-terrain vehicles, however they’ve managed to work in some of their big pram features into this compact travel pram. It has a reasonable sized hood and an okay basket given the size of the pram. It only has a half recline so you will need the additional bassinet or car seat attachment to be suitable from birth, but it more than makes up for that with a 20kg weight capacity – so while not ideal for newborns it’s fantastic for toddlers and even preschoolers. If you’ve read any of my previous reviews you’ll know I’m a BIG fan of Baby Jogger prams. Big. Huge. Love them so much and the City Tour is no exception. It has a great weight limit of 20kgs. It also has a HUGE hood and great basket for such a compact pram. As you’d expect from a Baby Jogger pram the fold is swift and simple and can easily be done one handed. AND it comes with a backpack travel bag – personally I think is this is the best travel pram. HOWEVER – the recline isn’t fully flat and I can’t find either a bassinet or travel system attachments, so unfortunately it’s not suitable for newborns. While the GB Qbit+ is the heaviest pram in this list it is the only one that has a fully flat recline, meaning it is suitable for newborns with no extra attachments. The hood is generous, the basket is a decent size, it has an adjustable foot rest, and a spectacularly simple one handed fold. I just wish it has a higher weight capacity as it’s only 17kgs. Every time I go out I always see people zipping around with their Babyzen Yoyo. 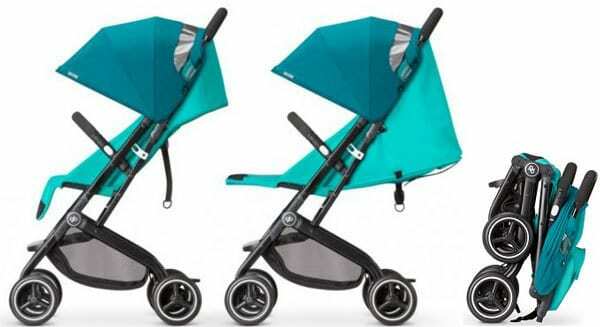 Not only because of it’s distinct and eye-catching design, but because these really are a great everyday pram. Though they are light and compact enough to take traveling! For such a small pram it does have a generous hood and a good sized basket. While the seat does have a half recline you will need to buy a separate bassinet attachment to make the Babyzen Yoyo suitable from birth. Alternatively it can be used with compatible car seats. So I hope that helps you find the best travel pram for you family. If you’re still not sure please feel free to ask any questions, or suggest any other prams you’d like to see added to this list – or that you’d like me to review in the future! I just got a virus pop thing when I clicked this link I’m not sure what’s going on ?